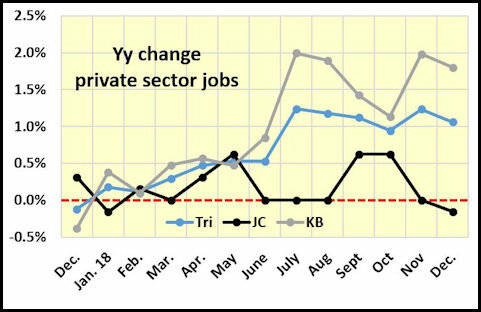 December – preliminary 2018 annual – job report was a mix of good and not-so-good news. U.S. hiring surged during December, but not in the Tri-Cities. The region’s economy lost 400 nonfarm jobs but finished the year with an average of 1,150 more jobs than 2017. The net annual totals will be available in the January labor market reports. December’s employment was down by 1,980 people, and the unemployment rate dropped to 3.4%. Unemployment dropped because there were 2,130 fewer people in the labor force. The annual employment monthly average improved by 2064 people while stronger hiring brought an additional 1,315 people into the labor force. The preliminary, non-adjusted annual total shows the seven-county region was close to the pre-recession recovery level. It had 417 fewer nonfarm jobs in 2018 than it did in 2008. A clearer picture will come with next month’s adjustment of the numbers. Most of the December and preliminary annual report shows an improved Tri-Cities labor market. But there are some soft spots. For example. 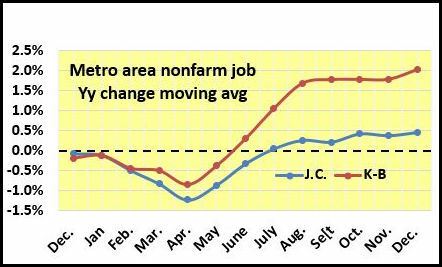 While the three-county Johnson City MSA had the best job growth in December, it ended the year with 67 fewer nonfarm jobs than it had in 2017- a 0.1% job loss. The four-county Kingsport-Bristol MSA had 1,275 more jobs than it did in 2017 for annual growth of 1%. There were only four job sectors where both of the region’s MSAs had annual job gains: Manufacturing, Transportation and Utilities, Professional and Business Services and State employees. Here’s how the 2018 nonfarm job gain/loss look by job sector compared to 2017. Johnson City MSA 2,325, up 117. Johnson City MSA 7,675, up 83. Johnson City 10,383, down 33. Johnson City 1,000, up 50. Johnson City 1,292, down 33. Johnson City 4,333, down 8. Johnson City 13,950, down 308. Johnson City 2,400, down 83. Kingsport- Bristol 825, down 67.